Contrary to Prof. Lynch's view, there remain critical issues with how data from the PACE trial has been generated, interpreted, and presented, the general nature of which he is aware [1,2]. These issues include: using only subjective self-report measures for primary outcome; failing to report results fully and appropriately; inadequate use of objective measures; and discrepancies between subjective and objective measures, a known problem in this area of medicine . PACE reports the results on both primary measures at outcome (one year follow-up), for the Cognitive Behavioural Therapy (CBT) and Graded Exercise Therapy (GET) arms, were that "No more than 30% of participants were within normal ranges..." . However, all four trial arms received Specialist Medical Care (SMC) which alone accounts for a 15% improvement, so no more than an additional 15% of patients reported a "normal" range outcome following those two treatments, with questions about how that normal was more loosely re-defined at the analysis stage of this non-blinded study. There was no difference between the CBT, Adaptive Pacing Therapy (APT), and SMC arms on the only objective physical measure reported at outcome (6-Minute Walking Distance Test, 6MWT), and while there was a difference for the GET arm it failed to reach clinical significance (achieving a gain of just 35.3 metres, as mean difference from SMC) . Patients in active treatment arms had a mean age of 40 years (at outcome), but their mean 6MWT scores were worse than healthy 70-80 year olds . They were also worse than Class III heart failure patients, with the only category of cardiopulmonary disease doing worse than PACE being End Stage Lung Disease [7,8]. The 6MWT was not repeated 24-48 hours later, thus failing to objectively quantify post-exertional malaise (PEM), with only a single subjective self-report measure used for this arguably cardinal symptom [9,10]. The uninterrupted walking distance used for the 6MWT was an unusually low 10 metres, a possible confounder . However, more robust data shows no significant difference between shorter and longer uninterrupted distances, and even correcting for the maximum difference found by Ng (17%) the PACE results still do not reach clinical significance [5,11,12]. Outcome data for the 6MWT is only available for 69-74% of patients, compared to the range for self-report measures of 89-97%, with no explanation provided for that missing data, and no data reported on whether the non-responders were different in any way to those who undertook the test. Furthermore, the lowest reporting rate for the 6MWT was in the GET arm, which was also the arm reporting the best 6MWT result. These are potential sources of bias in favour of a reported improvement, because the failure of those patients to take this physical test at outcome may have been due to their deterioration over the course of the trial. Baseline data was gathered for the two remaining objective physical measures listed in the trial protocol (Self-Paced Step Test - ST, and actigraphy), but no outcome data was reported for either, with no explanation provided for the missing ST data, and a problematic one offered for the omitted actigraphy data [13,14]. The Client Service Receipt Inventory (CSRI) showed no improvement in the more objective "real world" measures of employment participation, reliance on welfare or on disability or income insurance, nor total service usage and costs . Improvement was only shown on some subjective self-report based measures such as the EuroQol (EQ-5D, not yet confirmed as an appropriate instrument for CFS), Clinical Global Impression, HADS anxiety and depression scales, Work and Social Adjustment Scale, symptom count, and PEM [4,15,16,17]. Previous studies have not found that CBT or GET lead to improvements in objective actigraphy results . Nor have they found any correlation (at outcome) between subjective self-report measures and objective actigraphy results : No comparable correlation calculations have been published by PACE for either the 6MWT, or the objective measures in the CSRI. But the lack of statistically significant results for those components of the CSRI, and for the 6MWT in the CBT, APT, and SMC arms, rule out any possible correlations there. As previously noted, the 6MWT results for the GET arm did reach statistical significance but failed to reach clinical significance, so even if a correlation exists here it is unlikely to be of much practical value. The general pattern of improvement on the two primary outcome measures was that the bulk of it occurred during the initial 3 months of the 6 month long therapy period, then tapered off asymptotically, with decreasing additional improvement over the remainder of the 12 month trial. This pattern of subjective self-report response, combined with the lack of objective correlations, could be explained by confounding generic influences such as priming, and social desirability. Even with the lax post-hoc criteria for improvement the Number Needed to Treat for both CBT and GET to achieve these results was an unimpressive 1 in 7, with those two treatments only mediating approximately 20% of the already modest total effect [16,18]. PACE also excluded the sickest patients, (those unable to attend a study centre, potentially 25% of the patient population ). Longer term follow-up data has not yet been reported, so we do not know if even these methodologically problematic and clinically marginal results are sustained. Lastly, probably the two most comparable contemporary trials to PACE (Núñez, and FINE - "the sister study to PACE") failed to support its therapeutic claims [20,21,22]. Collectively these findings do not suggest that the CBT-GET based model employed by PACE has demonstrated sufficient explanatory or therapeutic power upon which to safely and productively build clinical and research programs. If anything they have confirmed the paucity of that model, and the increasingly urgent need to look elsewhere for answers to this troubled, refractory, and distressing condition. Prof. Stephen Holgate, chair of the UK CFS/ME Research Collaborative, gave a keynote speech recently in which he described our current understanding of this condition as "bathing... ...in ignorance" . I can only agree. 3. Wiborg JF, et al. How does cognitive behaviour therapy reduce fatigue in patients with chronic fatigue syndrome? The role of physical activity. Psychol Med. 2010 Aug;40(8):1281-7. doi: 10.1017/S0033291709992212. 4. White PD, Goldsmith KA, Johnson AL, et al, on behalf of the PACE trial management group. Comparison of adaptive pacing therapy, cognitive behaviour therapy, graded exercise therapy, and specialist medical care for chronic fatigue syndrome (PACE): a randomised trial. Lancet, 2011; published online Feb 18. DOI:10.1016/S0140-6736(11)60096-2. 5. Wise RA, Brown CD. Minimal clinically important differences in the six-minute walk test and the incremental shuttle walking test. 6. Enright PL, Sherrill DL. Reference equations for the six-minute walk in healthy adults. 7. Lipkin DP, Scriven AJ, Crake T, Poole-Wilson PA. (1986) Six minute walking test for assessing exercise capacity in chronic heart failure. Br Med J (Clin Res Ed). 292:653-5. 8. Ross RM, Murthy JN, Wollak ID, Jackson AS. The six minute walk test accurately estimates mean peak oxygen uptake. 9. VanNess JM, et al. Postexertional malaise in women with chronic fatigue syndrome. J Womens Health (Larchmt). 2010 Feb; 19(2): 239-44. 10. Light AR, et al. Moderate exercise increases expression for sensory, adrenergic, and immune genes in chronic fatigue syndrome patients but not in normal subjects. 11. Ng SS, et al. Walkway Length, But Not Turning Direction, Determines the Six-Minute Walk Test Distance in Individuals With Stroke. 12. Sciurba F, et al. Six-minute walk distance in chronic obstructive pulmonary disease: reproducibility and effect of walking course layout and length. Am J Respir Crit Care Med. 2003 Jun 1;167(11):1522-7. Epub 2003 Feb 20. 13. White PD, Sharpe MC,Chalder T, DeCesare JC and Walwyn R for the PACE trial group. Protocol for the PACE trial: A randomised controlled trial of adaptive pacing, cognitive behaviour therapy, and graded exercise as supplements to standardised specialist medical care versus standardised specialist medical care alone for patients with the chronic fatigue syndrome/myalgic encephalomyelitis or encephalopathy. 15. McCrone P, Sharpe M, Chalder T, et al. Adaptive pacing, cognitive behaviour therapy, graded exercise, and specialist medical care for chronic fatigue syndrome: a cost-effectiveness analysis. 16. P. D. White, K. Goldsmith, A. L. Johnson, T. Chalder and M. Sharpe (2013). Recovery from chronic fatigue syndrome after treatments given in the PACE trial. 17. Cella M, Sharpe M, Chalder T. Measuring disability in chronic fatigue syndrome: reliability and validity of the Work and Social Adjustment Scale. J Psychosom Res. 2011 Sep;71(3):124-8. doi: 10.1016/j.jpsychores.2011.02.009. 18. Goldsmith K, et al. How do treatments for chronic fatigue syndrome work? Exploration of instrumental variable methods for mediation analysis in PACE – a randomised controlled trial of adaptive pacing therapy, cognitive behaviour therapy, graded exercise therapy, and specialist medical care. 19. CFS/ME Working Group. Report to the Chief Medical Officer of an Independent Working Group. London: Department of Health; Jan 2002. 21. Wearden AJ, et al. Nurse led, home based self help treatment for patients in primary care with chronic fatigue syndrome: randomised controlled trial. Anybody who has physical function of 60 on the sf-36 scale and above means your physical function is equal to 84.1% of a demographically representative English adult population Bowling (1999)(1) (See Figure 1). On first look, this may look like anybody in the PACE trial (2) who has physical function of 60 and above on the SF-36 scale can be classed as recovered because 84.1% of a demographically representative English adult population Bowling (1999) has a score of 60 or above on the SF-36 scale. This is because the PACE trial used the mean (SD) scores from these figures and derived a mean (SD) score of 84 (24) for the whole sample, giving a normal range of 60 or above on SF-36 scale for physical function. Professor White very kindly sent me the ages of the participants in the PACE trial. The reason I asked for this information was because Bowling (1999) participant sample for physical function was weighted relatively equally across all age groups. When I received the age groups of the PACE trial, I plotted them on a graph against Bowling (1999) and I noticed that the age of the participants in the PACE trial were not a true representation of the Bowling (1999) physical function age ranges. Figure 2 clearly shows that the PACE trials participants’ ages has a left skewed distribution towards younger people, and the Bowling age groups has a plateau distribution. As younger people have a higher level of physical functioning according to Bowling (1999) (can also be shown by the Figure 2 via the green bar chart), surely the score of 60 on the sf-36 scale and above for normal physical function, should have been higher? I found that approximately 12% of participants in the PACE trial were over the age of 55, compared with 40% in the Bowling (1999) participants. 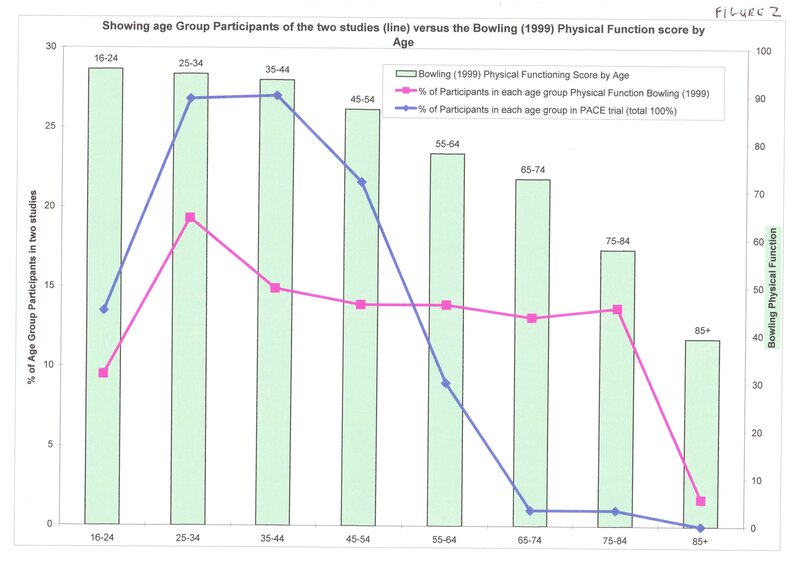 Surely the PACE trial should have compared each participants’ age to the corresponding physical function in Bowling (1999), in order to work out what a normal range was for physical function? (please note, the age groups given to me by Professor White, didn’t exactly match the Bowling (1999) age brackets, so I had to make some assumptions in which age group the PACE trial participants fitted into, nevertheless, because I used the weighted means I believe you should get a more realistic normal physical function expectations according to the age of participants in the PACE trial). 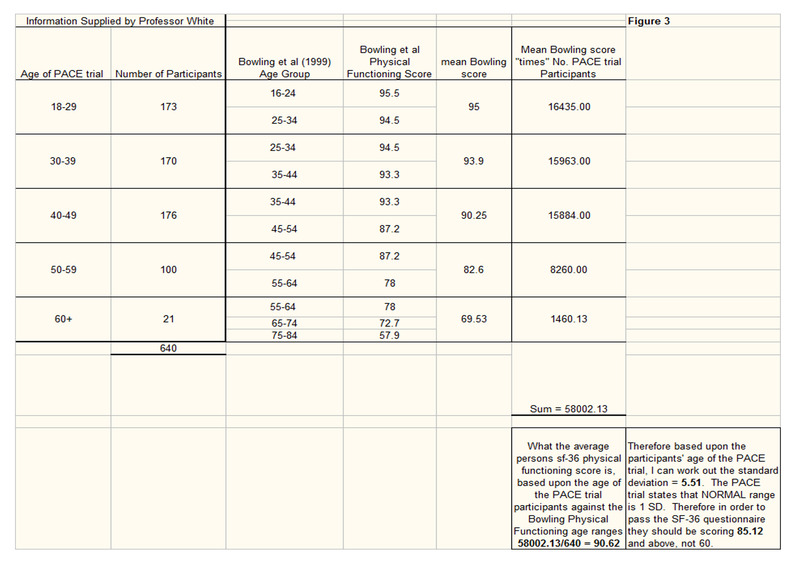 From my own calculations using the data from Professor White of the age of the participants in the PACE trial, and using this against the corresponding Bowling (1999) age brackets, I found that the mean score of a normal person physical function should have been 90.62 and a corresponding standard deviation of 5.51. Therefore using the PACE trial criteria of 1 stand deviation for someone to meet the criteria of recovery in the SF-36 questionnaire they should be reaching a score of 85.12 for normal physical function (please see my workings in Figure 3). This is significantly higher than 60. Please note, I am not questioning that the figures show an improvement in physical function, but my concern is the definition of recovery from a score of 60 on the sf-36 scale. Following publication of the PACE Trial results in 2011, White et al wrote to The Lancet's editor Richard Horton stating that: "The normal range analysis was plainly stated as post hoc, given in response to a reviewer's request." From this it is clear that the normal range analysis was performed after trial data were examined. This is important because it shows that the decision to replace the protocol's strict definition of recovery with far less demanding criteria was made after the trial's results were known, as the revised criteria were taken directly from the same normal range analysis. Sean Lynch argues that "protocol changes are not that unusual in large trials" and this may be so. However, it is clearly unsatisfactory to allow investigators to analyse trial data first before choosing how to define something as important as recovery. Published protocols exist to protect patients. We ignore them at our peril. White PD, Johnson AL, Goldsmith K, Chalder T, Sharpe MC. Recovery from chronic fatigue syndrome after treatments given in the PACE trial. Psychol Med 2013;1-9, published online 31 Jan. doi:10.1017/S0033291713000020. Sean Lynch wrote that "protocol changes are not that unusual in large trials and can reflect pragmatic as well as scientific and ethical changes and are not necessarily sinister or representative of a hidden agenda." Peter Kemp questioned whether all these protocol changes were valid or justified. Lynch replied that he feels he can "trust the independence and integrity of the Steering Committee and statistical analysis". However, it appears that the Trial Steering Committee (TSC) were possibly not involved with some major post-hoc changes and that the justification for at least one of these major changes was erroneous. The Statistical Analysis Plan (SAP) was to explain protocol changes and "make public and to report in detail the planned analyses that were approved by the Trial Steering Committee in May 2010". Despite impressions in the 2011 Lancet paper[5a] and authors' reply[5b] that protocol changes were guided by the SAP, approved by the TSC, and made before outcome data were examined, the SAP mentions nothing of the controversial changes which appeared in the Lancet paper, the so-called 'normal range' in fatigue and physical function, therein described as a post-hoc analysis. Nor does the SAP mention anything about the redefining of 'recovery', which is now fundamentally based on the same post-hoc 'normal range', where the recovery threshold for SF-36 physical function (PF) was lowered from 85 to 60 out of 100. White et al. of the PACE Trial claimed that the original PF threshold was abandoned because a score of >=85 points would have excluded approximately half the general working age population. As outlined by Adrian Baldwin's letter, this justification was incorrect and based on confusing a mean score for a median score. How did this error pass the trial statistician, independent scrutiny from the TSC, and the peer-review process of the journal in which it was published? It is unclear how this change could "more accurately reflect recovery" as claimed by PACE, when it is lower than the trial eligibility criteria for 'significant disability' and was derived from a general population sample including the elderly and chronically disabled. PACE/White et al never justified why it was appropriate to use mean minus 1 standard deviation (S.D.) on such a dataset to calculate a threshold of normal/recovered physical function for healthy people of middle age. A previous paper co-authored by White, highlighted concerns about the use of mean minus SD on a non-normal distribution of scores but PACE went on to do exactly that, despite a warning from the authors of the general population study that the distribution was heavily skewed. Furthermore, the claim that their method and threshold was more "conservative" than the previous work of Knoop et al. (in which White was a co-author) was also incorrect. This latter paper used mean minus 1SD just as PACE did (not mean minus 2SD as claimed by PACE) and used a healthy population instead of a general population to calculate a higher threshold of 80 points. PACE maintain that a UK general population is "demographically representative". Instead, the threshold for 'normal' physical function ended up being a 5 point gap in the other direction. A FOI request revealed that 13% of significantly disabled trial participants had qualified for 'normal' physical function at the beginning of the trial. The mean(SD) age of trial participants at 52 week followup was about 39(12) years. To score 60 points in physical function (range 0-100, 5 point increments), a patient must report significant limitations in multiple domains (somewhere between minor limitations for 8/10 questions or major limitations in 4/10 questions), which is unusual for healthy people of working age and an unsuitable goalpost for a full 'recovery'. A study with 23 female CFS patients of similar age to PACE participants reported a mean(SD) score in physical function for the 25 healthy age-matched sedentary controls of 96.8(4.5) points. A mean score of 96 was reported in a larger CFS study with 99 healthy controls and a mean(SD) of 96.6(10) has also been reported for a healthy reference group consisting of 906 people. The mean minus 1SD score on these (non-UK) populations, rounded up to the nearest 5 point increment, gives a threshold of 90-95 points, even higher than in the original PACE protocol before 85 was lowered to 60. The PACE principal investigators have championed CBT/GET for CFS throughout their careers and declared to the Lancet conflicts of interest with the insurance industry. [5a] The PACE Trial demonstrated that the benefits of CBT/GET are much less than originally anticipated. As an open-label trial the researchers were also not blinded to general impressions about how the trial was going. The 2013 Psychological Medicine paper on 'recovery' indicated that changes were made to the definition before analysis was done for that particular paper, but failed to describe the 'normal range' base criteria as post-hoc, and unlike the Lancet paper did not mention TSC approval for the changes. There was no guarantee that changes occurred before examining the same data already used in previous papers. It is therefore plausible that PACE analyzed some trial data before making major, questionable, possibly unapproved, post-hoc changes to the protocol. The 2007 PACE protocol states, "The final trial publication will include all items recommended under CONSORT." In a parliamentary discussion, Baroness Wilcox stated that the MRC requires all MRC-funded clinical trials (such as PACE) comply with the CONSORT guidelines. Is it generally OK to make and publish major changes to the protocol after seeing the trial outcomes data? The CONSORT Group do not think so. 11. Queen Mary, University of London. FOI Request: 2013/F42. https://docs.google.com/document/d/17H8AQsMKkXnKDdm0JbpAWQXWWTNEXvaKWNRO... (Accessed: 24th November 2013). 13. VanNess JM, Stevens SR, Bateman L, Stiles TL, Snell CR. Postexertional malaise in women with chronic fatigue syndrome. J Womens Health (Larchmt). 2010 Feb;19(2):239-44. PMID 20095909. 14. Buchwald D, Pearlman T, Umali J, Schmaling K, Katon W. Functional status in patients with chronic fatigue syndrome, other fatiguing illnesses, and healthy individuals. Am J Med. 1996 Oct;101(4):364-70. PMID: 8873506. 15. Juenger J, Schellberg D, Kraemer S, Haunstetter A, Zugck C, Herzog W, Haass M. Health related quality of life in patients with congestive heart failure: comparison with other chronic diseases and relation to functional variables. Heart. 2002 Mar;87(3):235-41. PMID: 1184716. Sean Lynch reports that, in his view, the protocol changes for the PACE trial appear well justified. However, the accuracy of the factual claims used by the PACE trial researchers to explain their post-hoc outcome measures should be checked. The PACE trial's published protocol defined 'recovery' as requiring an SF-36 Physical Functioning (SF36-PF) questionnaire score of at least 85 out of 100, while the trial's entry criteria required a score of 65 or under, which was taken to indicate that patients' fatigue was disabling. The post-hoc criteria for recovery allowed patients with an SF36-PF score of 60 to be classed as recovered. This change was justified by the claim that a threshold of 85 would mean “approximately half the general working age population would fall outside the normal range.” In fact, the data cited showed that the median score for the working age population was 100, less than 18% of the general working age population had a score under 85, and 15% had declared a long-term health problem[4,5]. An SF36-PF score of 60 was claimed in the Lancet PACE paper to be the mean -1sd of the working age population, and thus a suitable threshold for ‘normal’ disability. They had in fact used data which included all those aged over 65, reducing the mean physical function score and increasing the SD. For the working age population the mean -1sd was over 70, requiring patients to score at least 75 to fall within this ‘normal range’. Also, the trial's protocol makes it clear that the thresholds for recovery (including ≥85 for SF-36 PF) were intended to be more demanding than those for the mean -1sd, reporting that: “A score of 70 is about one standard deviation below the mean... for the UK adult population”. The post-hoc criteria for recovery so clearly overlapped with the trial's own criteria for severe and disabling fatigue that an additional element needed to be introduced, mandating that ‘recovered’ patients not also fulfil every aspect of the trial's criteria for CFS. Even so, patients could still have been classed as recovered when reporting no change, or even a decline, in either one of the trial’s primary outcomes. Even using the loose post-hoc criteria for recovery, only 22% of patients were classed as recovered following treatment with specialist medical care and additional CBT or GET. Regardless, the BMJ had reported that PACE showed CBT and GET “cured” 30% and 28% of patients respectively, a Lancet commentary claimed that about 30% recovered using a “strict criterion” for recovery, and a paper aimed at NHS commissioners stated PACE indicated a recovery rate of 30-40% for CBT and GET[9,10]. It is wrong for such misstatements of fact to be allowed to go on affecting how doctors treat their patients, how funding decisions are made, and the information that patients are provided with before deciding whether to consent to particular interventions. The changes to the outcome measures used in the PACE trial may not be “representative of a hidden agenda”, but they were misguided, justified by inaccurate claims, and have been misleading to others. The refusal to allow patients access to data on the outcome measures laid out in the trial’s protocol reflects a sad dismissal of their right to be informed about the medical treatments they are being encouraged to pursue[11,12,13]. Lynch goes on to recommend the use of pragmatic trials as a way forward for CFS/ME research. This is unlikely to be helpful. In response to the paper cited by Lynch, professor of complementary medicine Edzard Ernst pointed out that: “drawbacks might mean that the cmRCT generates false positive results. I can, for instance, imagine a pure placebo, like homeopathy, coming out of such a test smelling of roses.” There was a time when it was claimed by some that homeopathy was a promising medical treatment. It is now more widely recognised that homeopathy can simply affect how patients report their symptoms in non-blinded trials, and that it is not ethical to promote it as a legitimate form of medicine. In the case of cognitive and behavioural interventions for CFS/ME, we have evidence from the PACE trial that they are able to lead to modest improvements in patient questionnaire scores in a non-blinded trial, without leading to improvements in real world outcomes such as employment rates, or claims for disability benefits. A meta-analysis of actometer data from CBT trials for CFS also found that CBT was able to lead to improvements in questionnaire scores in non-blinded trials, but not to improvements in the amount of activity that patients were actually able to perform. Sadly, the PACE trial dropped actometers as an outcome measure, although they were purchased and used at baseline. Recent evidence from a large study of NHS CFS/ME specialist services indicated that reported results for CBT and GET are poorer than those reported in PACE, and that centres offering CBT and GET achieved marginally worse results than centres offering ‘activity management’. We do not currently have compelling evidence that CBT or GET are more effective medical interventions for ME/CFS than homeopathy, despite some of the claims made by proponents. It should be seen as no more acceptable for those with financial, professional or ideological interests in promoting CBT or GET as treatments for ME/CFS to exaggerate the value of these interventions than it is for others to exaggerate the value of homeopathy. Anyone with a real interest in helping patients with ME/CFS, and in allowing them to make informed decisions about their own health care, should now call for the release of results for all of the outcomes laid out in the PACE trial's published protocol. Bowling A, Bond M, Jenkinson C, Lamping DL. Short form 36 (SF-36) health survey questionnaire: which normative data should be used? Comparisons between the norms provided by the Omnibus Survey in Britain, The Health Survey for England and the Oxford Healthy Life Survey. J Publ Health Med 1999, 21: 255–70. White PD, Goldsmith KA, Johnson AL, Potts L, Walwyn R, DeCesare JC, Baber HL, Burgess M, Clark LV, Cox DL, Bavinton J, Angus BJ, Murphy G, Murphy M, O’Dowd H, Wilks D, McCrone P, Chalder T, Sharpe M. Comparison of adaptive pacing therapy, cognitive behaviour therapy, graded exercise therapy, and specialist medical care for chronic fatigue syndrome (PACE): a randomised trial. Lancet 2011;377:823-36. Knoop H, Bleijenberg G. Chronic fatigue syndrome: where to PACE from here?. Lancet 2011; 377: 786-788. Collin SM, Crawley E, May MT, Sterne JAC, Hollingworth W: The impact of CFS/ME on employment and productivity in the UK: a cross-sectional study based on the CFS/ME national outcomes database. BMC Health Serv Res 2011, 11:217. McCrone P, Sharpe M, Chalder T, Knapp M, Johnson AL, Goldsmith KA, White PD. (2012) Adaptive pacing, cognitive behaviour therapy, graded exercise, and specialist medical care for chronic fatigue syndrome: a cost-effectiveness analysis. PLoS ONE 7: e40808. Bleijenberg G, Prins JB, Wiborg JF, Knoop H, Stulemeijer M,. 'How does cognitive behaviour therapy reduce fatigue in patients with chronic fatigue syndrome? The role of physical activity.' Psychol Med. 2010 Aug;40(8):1281-7. Crawley E, Collin SM, White PD, Rimes K, Sterne JA, May MT; CFS/ME National Outcomes Database. (2013) Treatment outcome in adults with chronic fatigue syndrome: a prospective study in England based on the CFS/ME National Outcomes Database. QJM. 106:555-65. Competing interests: I believe that the current tolerance for preventing patients from accessing data on the efficacy of the treatments available to them will be looked back upon with a sense of real shame. Similarly, we do not know what information the ethical and steering committees were given and considered when giving the PACE trial initial approval. Readers of the BMJ may not be aware that this premise is rejected by the majority of researchers in the field as it completely ignores the international biomedical research literature which invalidates it and which clearly shows that ME/CFS is a multi-system organic disease perpetuated by ongoing disease processes (2)(3). Yet the PACE trial paper fails to mention the existence of any of the biomedical research evidence and an unsuspecting reader could be excused for assuming it didn’t exist. This begs the question: were the ethics and steering committees made aware of the existence of the biomedical evidence base when they gave the trial approval? Recent correspondence from White, Kindlon, Lynch and others concerning changes to the PACE trial protocol should be seen within the context of the current debate on the governance of clinical trials. Campaigns such as AllTrials are pushing for the publication of trial protocols, but is it then acceptable to change the protocol and if so how and for what reasons? To justify changes by saying ‘Protocol changes are not that unusual in large trials’, as Lynch  does, will not enhance trust in published results. A further consideration is how much stricter should the governance processes be for trials such as PACE that are not blinded meaning changes made even prior to data analysis could be biased. It may be necessary to change a protocol to take account of new research findings or to change statistical tests to better match the distribution of the data. However, widespread protocol changes, particularly in the way outcomes are measured suggest either a weak protocol design and validation process, or tinkering to improve results. Large trials typically follow smaller exploratory trials and this should reduce the necessity for changes in large trials. PACE was a large trial following similar smaller trials so there are no excuses for needing to change the protocol. To quickly examine a couple of the many changes: Firstly, White et al  change the scoring system used for one of the primary outcomes giving the reason for their change in scoring system as “we changed the original bimodal scoring of the Chalder fatigue questionnaire (range 0–11) to Likert scoring to more sensitively test our hypotheses of effectiveness.” However, they fail to present any evidence or references that would support this assertion or even that the Likert scoring had been validated. The FINE trial ran on similar lines to PACE and reported that a non-significant difference with bimodal scoring became a significant difference using this alternative Likert marking scheme . Secondly, they made an error in their reasoning about changes in the thresholds used to define recovery. White et al justify the change in one threshold for recovery as “We changed our original protocol’s threshold score for being within a normal range on this measure from a score of <85 to a lower score as that threshold would mean that approximately half the general working age population would fall outside the normal range. The mean (S.D.) scores for a demographically representative English adult population were 86.3 (22.5) for males and 81.8 (25.7) for females (Bowling et al. 1999) . We derived a mean (S.D.) score of 84 (24) for the whole sample, giving a normal range of 60 or above for physical function.”  The data used for the Bowling survey is available in the national archive  and the median for those of working age (less than 65) is 100 with the 25th quartile being 90. This means that the PACE trial authors' assertion is wrong. The mean value White et al use is for the overall population, but even here the median is 95 (that is half the population score 95 or more). 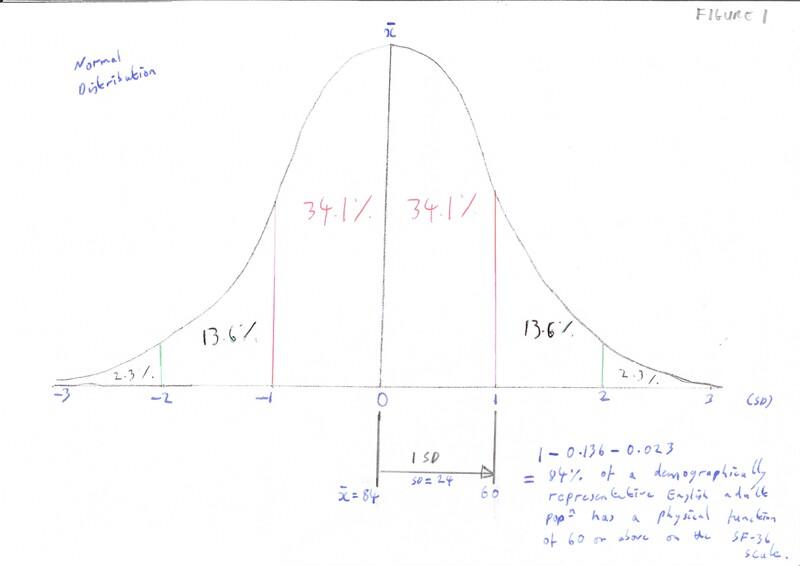 Their mistake was to use the mean and standard deviation, which do not properly characterize the distribution of scores. This leads to the question of how clinical decision makers and patients can know that a steering committee provide effective governance. We do not know what information they were given and considered in approving changes to the protocol. The peer review process for the journals publishing the various PACE trial results has not been effective in ensuring full explanations for the reasons for protocol changes made post publication. It would have been helpful if White et al had released data according to the original protocol alongside their new versions. Such transparency would have gone some way to reduce patients’ concerns and would have reduced the freedom of information requests that White is so keen to complain about. Transparency of the governance process is necessary to engender trust particularly where changes are made to a protocol. Transparency over the full results set is also advantageous. By keeping parts of the clinical trial data and its governance process secret, researchers are creating unnecessary uncertainty for patients and clinical decision makers around the effectiveness of treatments and associated risks. For many this is unacceptable. White PD, Goldsmith KA, Johnson AL, Potts L, Walwyn R, DeCesare JC, Baber HL, Burgess M, Clark LV, Cox DL, Bavinton J, Angus BJ, Murphy G, Murphy M, O’Dowd H, Wilks D, McCrone P, Chalder T, Sharpe M; PACE trial management group (2011). Comparison of adaptive pacing therapy, cognitive behaviour therapy, graded exercise therapy, and specialist medical care for chronic fatigue syndrome (PACE): a randomised trial. Lancet 377, 823–836. White PD, Goldsmith K, Johnson AL, Chalder T, Sharpe M; PACE Trial Management Group (2013). Recovery from chronic fatigue syndrome after treatments given in the PACE trial. Psychological Medicine Jan 31:1-9. Bowling A, Bond M, Jenkinson C, Lamping DL (1999). Short Form 36 (SF-36) Health Survey Questionnaire: which normative data should be used? Comparisons between the norms provided by the Omnibus Survey in Britain, the Health Survey for England and the Oxford Healthy Life Survey. Journal of Public Health Medicine 21, 255–270. There were many major faults in the published analysis of the PACE trial data: numerical, statistical and logical. Even far back in the days of John Snow and his study of cholera, or Ignaz Semmelweis and puerperal fever, a good grasp of statistics has been essential. Sometimes it is difficult to realise the magnitude of these errors, so let me just illustrate one of them – the use of the mean and variance to determine boundaries. The SF-36 Physical Functioning scale is a 21 point scale, where each point is multiplied by 5 to give a score out of 100 (0 to 100 inclusive). It is designed to measure difficulty in functioning, as opposed to measuring the range of physical function in healthy folk, so when applied to a random sample of adults there is a heavy bias, or clumping effect, at the maximum, healthy score of 100. In such a biased distribution, statisticians use the middle value, or median, to determine the "average" value, and for the SF-36 physical function it would be 100. Over 80% people of working age without long-term illness would have scores of 90 or more. To define normal function, the authors of the PACE trial used normative data from a study by Bowling which warned of a heavily clumped (or skewed) distribution of scores. PACE decided to set the boundary for normal function at a score of 60 or above, using the mean (84) minus one standard deviation (s.d.) of 24. As a comparison, the distribution for incomes in the UK in 2007/08 has comparable measure of bias, a mean of £26800 and a standard deviation of £29500. Using mean minus s.d. gives us a "normal" income of anything above minus £2700, which is as inappropriate to income as the SF-36 target score of 60 is to normality/recovery. There can be no statistical justification for accepting that the mean minus s.d. here somehow defines normality. I believe that the results of the PACE study are indeed significant, but that its evidence clearly shows that the default assumption of the importance of psychological factors in ME/CFS is unjustified. The data from Wikipedia (http://en.wikipedia.org/wiki/Income_in_the_United_Kingdom) is simpler to follow than that of the Office For National Statistics. With reference to myalgic encephalomyelitis (ME), also known as chronic fatigue syndrome (CFS), Jeremy Luke, who declares that he is a UK based medical general practitioner, apparently equates 'ME specialists' to 'snake oil salesmen' and conspiracy theorists etc . It is difficult to understand exactly what Luke means, but my interpretation is that he does not consider 'ME' to be a real illness (e.g. he hints that it is a 'belief'). Unfortunately, too many CFS/ME patients are all too familiar with such a dismissive attitude from a significant minority of health service professionals [2,3,4,5]. In 2013, the USA's Food and Drug Administration (FDA) brought together CFS/ME patients at a conference, and carried out a listening exercise, in relation to illness experiences. In my opinion, the resulting document ('The Voice of the Patient') is an excellent and comprehensive description of the illness, and should be required reading for all health professionals. As a patient, I wholeheartedly recommend that Jeremy Luke, and all medical professionals, read the document . 4. Anderson VR, Jason LA, Hlavaty L, Porter N, Cudia J. (2012) A Review and Meta-Synthesis of Qualitative Studies on Myalgic Encephalomyelitis/Chronic Fatigue Syndrome. Patient Educ Couns. 86:147–155. 5. Jason LA, Richman JA. (2008) How science can stigmatize: The case of CFS. J Chronic Fatigue Syndr. 14:85-103. Lynch suggests that resources should be made available for pragmatic trials to test cognitive-behavioural interventions for myalgic encephalomyelitis / chronic fatigue syndrome (ME/CFS) in clinical settings . It would be worthwhile to examine the priorities of the patients the research is intended to benefit. In 2013, Action for ME (one of the UK’s largest ME/CFS patient organisations) carried out a survey asking ME/CFS patients and their carers to list their priorities for future research. At the top of the list of priorities was investigation of the underlying pathology of ME/CFS, which received 41% of the 'first priority' votes. The fewest overall votes went to investigations into 'psychological aspects' which received only 0.7% of the 'first priority' votes . A large study (n=834) of health outcomes after treatment in CFS/ME specialist clinics in England’s National Health Service (NHS) was published in 2013 . Clinics that offer only cognitive behavioural therapy (CBT) and graded exercise therapy (GET) were assessed alongside clinics that offer only ‘activity management’, and the latter were found to be marginally more effective. The two primary outcome measures used for the study were the same as for the PACE Trial (i.e. self-reported Chalder fatigue and SF-36 physical function scales) . Overall, NHS specialist clinics were found to be clinically ineffective at improving physical function. For improving fatigue, Crawley et al. describe the NHS clinical services as moderately effective. However, roughly half of the treated patients’ data was lost at follow-up and, considering that this study had no control group, the results are not robust. This is particularly the case considering that the PACE trial demonstrated that perception of fatigue improves for 65% of CFS patients over time (i.e. a 65% improvement rate without CBT or GET), when receiving similar basic medical care (i.e. usual medical care, symptomatic treatment, information about ME/CFS, and advice about avoiding extremes of activity) that patients attending NHS CFS/ME specialist clinics receive alongside cognitive-behavioural interventions. In the PACE Trial, such treatment was referred to as 'specialist medical care' (SMC). As is typical for cognitive-behavioural trials for CFS, the PACE Trial was open-label. It also lacked an adequate placebo control, and had different levels of encouragement and optimism between intervention groups [4,5]. These are common problems in cognitive-behavioural intervention studies [5,6] and are particularly relevant when objective measures do not match self-reported improvements [4,7]. The net clinical response rate of CBT and GET for the self-reported primary outcomes in the PACE Trial, was an average of 13% (i.e. the additional number of participants who achieved a clinically useful improvement when CBT or GET were added to SMC). This translates to a Number Needed to Treat of 1 in 8. These results are compatible with a placebo response in CFS . If the same results were reported in a homeopathy study with similar methodology as the PACE Trial (i.e. open-label and uncontrolled), the value of the results would rightly be widely questioned. A previous Cochrane systematic review of CBT for CFS reported that CBT was not superior to a waiting list control group, with the authors commenting that a possible explanation for this was that being on the waiting list for treatment had positive influence on participants . An under-reported result of the PACE trial was that CBT failed to significantly improve any objectively measured outcomes, including: physical disability (in a six minute walking distance test); employment hours; welfare benefit claims or private insurance claims. GET had similar results, but with a modest improvement (small effect size) in objectively measured physical disability [4,10]. For the PACE Trial, CBT and GET were based on a hypothesis whereby illness is said to be perpetuated by a ‘maladaptive avoidance of activity', 'exercise intolerance', and 'deconditioning' [11,12]. The disappointing results of the PACE trial suggest that the tested hypotheses are not supported by the data, and that symptoms and disability are caused by a different mechanism. ME/CFS patients describe experiencing sudden relapses (i.e. sudden symptom exacerbation) in response to over-exertion, despite sometimes experiencing relatively active periods of health in the run-up to a relapse . This does not seem to fit with the PACE Trial’s tested cognitive-behavioural hypotheses which do not anticipate or describe suddenly induced exercise intolerance or deconditioning after relatively active periods of health. Until these issues are acknowledged, candidly, by the medical and academic communities, then the (widely reported) mistrust between patients and professionals in the field of CFS/ME is perhaps unlikely be resolved. 3. Crawley E, Collin SM, White PD, Rimes K, Sterne JA, May MT; CFS/ME National Outcomes Database. (2013) Treatment outcome in adults with chronic fatigue syndrome: a prospective study in England based on the CFS/ME National Outcomes Database. QJM. 106:555-65. 4. White PD, Goldsmith KA, Johnson AL, Potts L, Walwyn R, DeCesare JC, Baber HL, Burgess M, Clark LV, Cox DL, Bavinton J, Angus BJ, Murphy G, Murphy M, O'Dowd H, Wilks D, McCrone P, Chalder T, Sharpe M; PACE trial management group. (2011) Comparison of adaptive pacing therapy, cognitive behaviour therapy, graded exercise therapy, and specialist medical care for chronic fatigue syndrome (PACE): a randomised trial. Lancet. 377:823-36. 5. Boot WR, Simons DJ, Stothart C, Stutts C. (2013) The Pervasive Problem With Placebos in Psychology Why Active Control Groups Are Not Sufficient to Rule Out Placebo Effects. Perspect Psychol Sci. 8:445-454. 7. Wiborg JF, Knoop H, Stulemeijer M, Prins JB, Bleijenberg G. (2010) How does cognitive behaviour therapy reduce fatigue in patients with chronic fatigue syndrome? The role of physical activity. Psychol Med. 40:1281-7. 8. Cho HJ, Hotopf M, Wessely S. (2005) The placebo response in the treatment of chronic fatigue syndrome: a systematic review and meta-analysis. Psychosom Med. 67:301-13. 9. Price JR, Mitchell E, Tidy E, Hunot V. (2009) Cognitive behaviour therapy for chronic fatigue syndrome in adults. Cochrane Database Syst Rev. CD001027. 10. McCrone P, Sharpe M, Chalder T, Knapp M, Johnson AL, Goldsmith KA, White PD. (2012) Adaptive pacing, cognitive behaviour therapy, graded exercise, and specialist medical care for chronic fatigue syndrome: a cost-effectiveness analysis. PLoS ONE 7: e40808. 12. White PD, Sharpe MC, Chalder T, et al. Protocol for the PACE trial: A randomised controlled trial of adaptive pacing, cognitive behaviour therapy, and graded exercise as supplements to standardised specialist medical care versus standardised specialist medical care alone for patients with the chronic fatigue syndrome/myalgic encephalomyelitis or encephalopathy. BMC Neurol. 2007 7:6.